Breaking News: There was a tremendous crash, and I rushed in my adult son's room to see this (another angle). What do we do? Our landlord has not been responsive in the past. There is no emergency number for him. Wtf??? We live in a 2bd/2ba in Long Beach, California. The apartment above is exactly the same as ours. It had been raining dirty bathwater in my son's room from the apartment above for several days, and we contacted the landlord repeatedly about that. He would say, I will come today for sure, and then not come, rinse, repeat. Last contact was Monday -- I will come today for sure, and I've asked your upstairs neighbors not to use that bathroom. He didn't come, but the rain stopped. Now this. My son is not safe in that room, clearly. The landlord must and will pay for him to stay in a motel. But how do we go about getting a real repair? Of the floor too? What about toxic mold? Am I safe in this apartment (my room is at the other end of the apartment and has no apparent damage)? What about my son's belongings? Just wtf in general? I do have some Ativan handy, and am taking slow, cleansing breaths. But what now? This is an almost comically clear case of landlord neglecting their responsibilities. Get an AirBNB for your son - cheaper and better than a motel! If you have renter's insurance, they should be your first call. Otherwise get a general contractor to come in an evaluate the situation as far as your safety and immediate next steps - Home Advisor or Next Door Recommendations if you don't know where to look, and make sure the general contractor understands the situation and can provide a formal write up. Inform the landlord by voicemail and email of every step and the costs. Keep receipts for everything and bill the landlord afterwards, they are most definitely responsible for this! Are you a freelancer by any chance? Keep a log of your time too, so you can bill them at your hourly rate for the time you spend on this. Long Beach tenant resources - see the section on repairs. Call the Long Beach Department of Health and Human Services at (562) 570-4132, and the Long Beach Building and Planning Department at (562) 570-2633. Hopefully they can guide you through remedies at that point, some of which are described on that site. You can also contact housing rights center in. LA. Yikes. Sorry you're dealing with this. Do what you can to move your son's stuff to a safer, drier spot and try to keep this area as dry as you can. In your position I'd definitely call the numbers adiabatic lists above for information on whether or not it's as dangerous mold-wise as you fear. Housing Long Beach has more on how to get repairs done here. Yes, start the process of hiring someone to fix this. Save photos and receipts. Continue to inform the landlord by phone and then in writing that you are hiring a contractor and will expect reimbursement. This usually triggers landlord action in my experience. Also please take a moment to use your phone call log to write down each time you called the landlord and what he said. Also note any damage to your own property. You can show he was aware and did nothing later if he fights you on any of the bills or whatnot. What a disaster! So sorry this happened! I second putting a call into your insurer if you have renter’s insurance and also a call into your local Dept of Health. Having a third part/regulator say the room or apartment or building is not safe will be good back up for you and may encourage your landlord to get their insurer involved, which might help down the line. That was the case for us as landlords when an unexpected thing made a tenant’s abode uninhabitable. At the time having the house condemned was upsetting, but if it had not been, I’m not sure our insurer would have been as cooperative. Please report this negligence immediately to Phone: (562) 570-LBDS (5237). This would be my first phone call. Print out copies of your phone logs and any emails + pics. For clarification, once this is established with the city, repairs will be inspected (I assume) and you will not have to worry about shoddy repairs or mold, etc. Did you contact the upstairs tenant? What in their apartment caused this? And get a dehumidifier running PDQ. If there's wet carpet, get it outta there. Don't just hire someone without your landlord's permission. Something like this will very likely cost more than one month's rent. Nolo.com says that you can't "repair and deduct" more than one month's rent at a time in California. I personally kept in contact with my local housing inspector's office when I had an outstanding repair issue in an apartment. I also communicated only in writing and got out of that building as soon as I could. You need to fix the water issue first, and that involves the renters above you. I have a very good relationship with the renters above me, so having someone come into their apartment too shouldn't be a problem. They have been suffering from our slumlord's inaction more than I have but have not involved the city. Perhaps some of them are undocumented, I suspect -- and certainly a great many people live in their apartment (10-12), and maybe the city would have an issue with that. But if I give them advance notice someone is coming out, maybe they can make arrangements just for that time, I'm thinking. But our landlord does have considerable leverage over them, and could evict them if he wanted so they must endure whatever our landlord does or doesn't do? Next, start pulling the stuff out of the room, turn on a fan or two. Then get a place to stay, call the landlord, etc. Per your update, this may not be 100% on the landlord as much as having way too many people in an apartment, which puts unusual stress on the building. Been calling everyone you suggested since it happened, no joy, I've called the fire department and they are coming out. 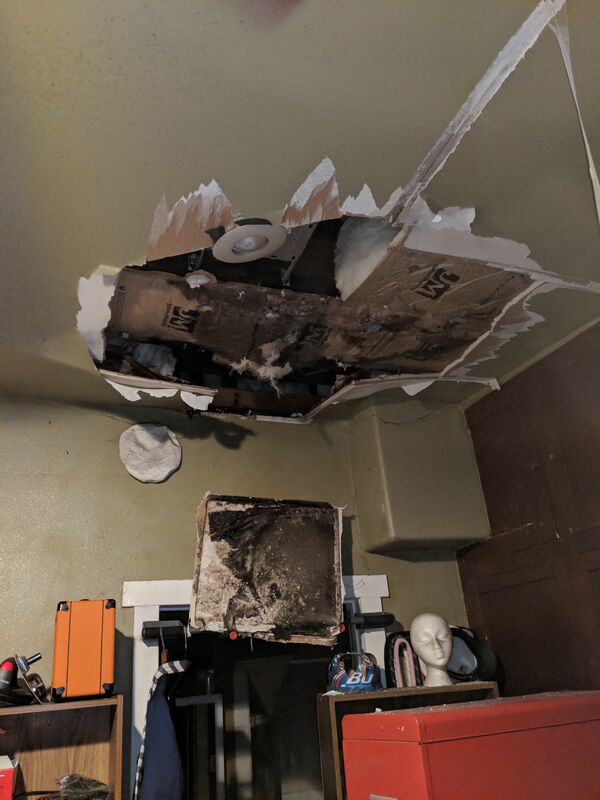 The fire department said that they thought the building was not structurally unsound, but that they could not assess potential danger from asbestos, mold, etc., and to stay out of that room. 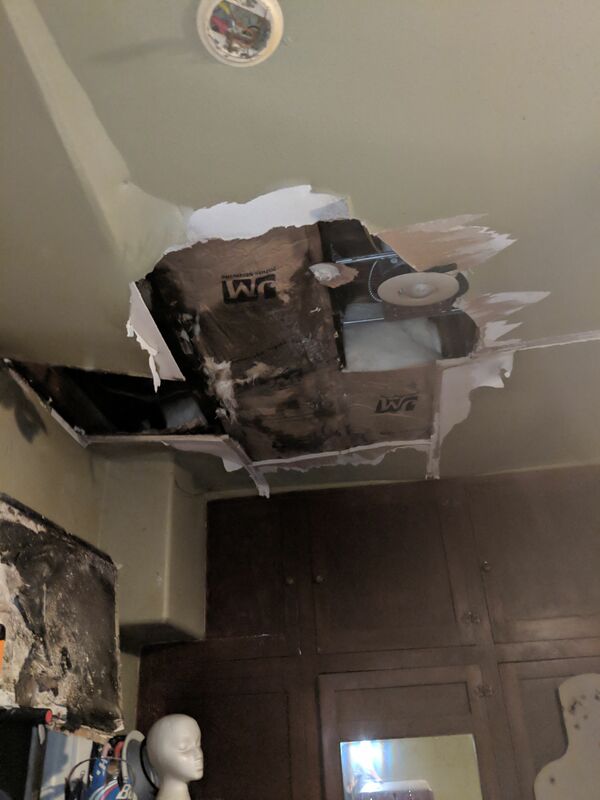 Have three water-damage contractors coming out to assess mold/asbestos etc. TODAY (Yay!) plus the city building inspector did call back and is coming too (Yay! ).